Here’s a treat for the end of the week: an absolutely sinful dessert/drink that is all about cake, strawberries and cream. The mouthwatering treats at Spoon Fork Bacon always give us serious dinner envy, and this recipe is one of the most tempting ones yet. I know what I’ll be doing with my evening! With London Fashion Week starting today, Lucy of the Bed Head Street Squad shows us how to recreate a staple model “I’m wearing no make up” look with just a few products and a lot of helpful tips. From a no make up look to a dramatic one; Colleen of Vanity and Vodka breaks out the electric blue eyeshadow and shows us how to make it supremely wearable in this gorgeous Anti-Valentine’s Day look. 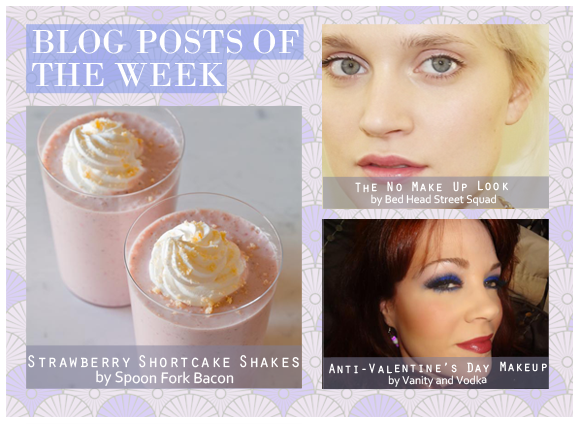 This entry was posted on Friday, February 17th, 2012 at 9:43 am and is filed under Blog Posts of the Week. You can follow any responses to this entry through the RSS 2.0 feed. You can skip to the end and leave a response. Pinging is currently not allowed.